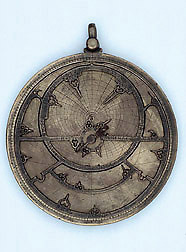 Although the instrument is unsigned and the attribution of a date is uncertain, this astrolabe has been given the earliest date among the western astrolabes in the collection in Oxford and, like the other very early examples, has been identified as Hispano-Moorish, that is, deriving from the Moorish culture in Spain. In decorating the rete the maker has used a simple but effective combination of circular apertures. For the bases of the star pointers these are variously used singly, in pairs or in triplets, and sometimes the triplet arrangement merges to form a trefoil. On two bands tying together the tropic of Capricorn, the equatorial band and the ecliptic, there are trefoil designs open on one side.